Marlin Martes was born and raised in the Bronx, New York. Growing up in New York City, she developed a profound interest in the social and environmental issues impacting urban areas. A Higher Education Opportunity Program Scholar, Marlin graduated from Fordham University with her B.A. in environmental policy, with a concentration in sustainable business and environmental design. During her undergraduate career, Marlin became involved as a mentor for Club Amigas, a Bronx-based program which aims to address the needs of underprivileged Latina youth inside and outside the classroom. Her love for the Hispanic community and environmental awareness also led her to intern for agencies like WXTV 41 Univision and the New York City Department of Environmental Protection (DEP). She aided the DEP’s “Water on the Go” campaign, educating New York City residents and tourists on the city’s water resources and preventative habits they could adopt to avoid water resource pollution. Academically, she enrolled in environmental courses allowing her to research and help develop solutions for distressed coral reef ecosystems. Marlin also helped develop a site plan to improve storm water runoff management using green infrastructure on Fordham University’s Rose Hill campus. 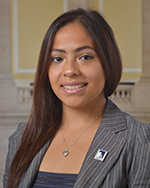 As a CHCI Public Policy Fellow, Marlin hopes to witness firsthand how different levels of government collaborate to solve and prevent environmental issues, particularly in low-income urban communities. Her desire is to aid in crafting greener cities for the generations of today and securing non-renewable resources for the generations of tomorrow.